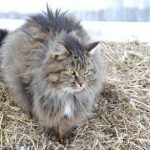 This post was written by Jennifer Krochko, owner of Whispurrs Cattery breeding Siberian cats in the state of Connecticut. 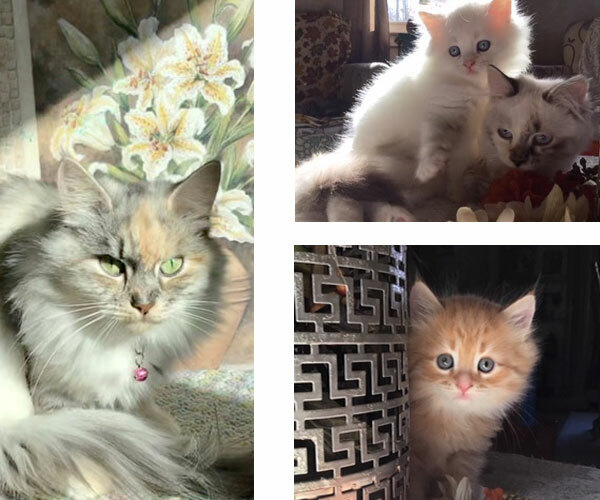 In it Jennifer shares a few things about her cattery, her approach to breeding, why she loves breeding Siberian cats and what the new/prospective Siberian cat owners need to know. 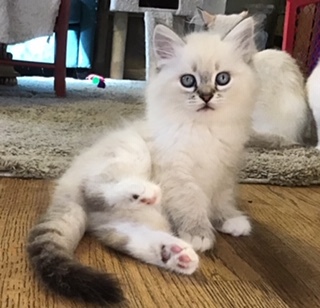 If you are looking for Siberian kittens in Connecticut, check Whispurrs cattery out! 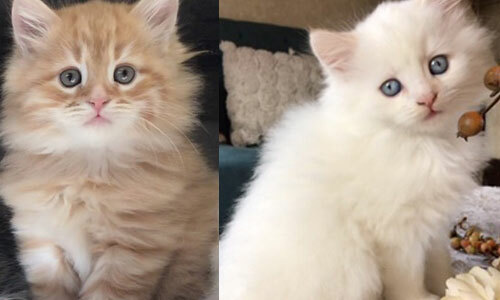 Siberians are truly the most wonderful breed. Smart, healthy, stunning good looks, but most of all the most genuinely sweet loving personalities. They are very addictive! For 30 years I have always had domestic short-hairs, and have done rescues. I am a true cat lover no matter the breed. Siberians came into my life when my daughter was born with head to toe eczema(for those of you that don’t know it is a terrible skin condition). My pediatrician explained it could well be a cat allergy, but she was too young to test. 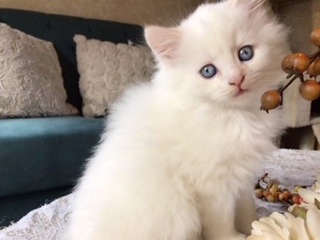 We got our first Siberian after learning of their hypoallergenic trait. From then on they melted my heart. People began to ask how they could get one, and it blossomed into a lifelong dream of having a cattery. The most wonderful thing to see is when a child that has never had a pet is able to have a kitty! Their true excitement is so heartwarming. I get to help people’s dreams come true! What could be better than that? Of course there are the ups and downs, and cleanings and vet visits, but it is a labor of love. The joy that is brings others far outweighs the tough times. I researched many years prior to starting my cattery. I did extensive reading, and talking to many many breeders to see how they run their catteries. It was a big step to take! I decided to do things a little differently than most. For one, I do welcome visits. I believe choosing a cattery is just as important as choosing a baby. You should be able to see how the babies are raised. I never cage my kitties. They are fully a part of my family and loved and handled every single day! I have 11 of my own children, and I work from home so they are used to people, my dog, and general noise! I feel it’s very important for them to be super socialised. I offer a one week return policy, just in the case of any severe reactions, but no one has taken me up on this offer as of yet! I offer a one year genetic health guarantee, too. I made sure to choose all my breeders from lines that were free from PKD and HCM. There have been zero cases thus far in my cattery. I am very particular that people wash their hands prior to handling the kitties. I also prefer to steam clean rather than use harsh chemicals. All my kitties are fed Blue Buffalo, both wet and dry. I also supplement my mommas with vitamins. I always take a step back to be sure all my families and kitties are happy. I never want my cattery to get too big, so there’s always enough attention for all. 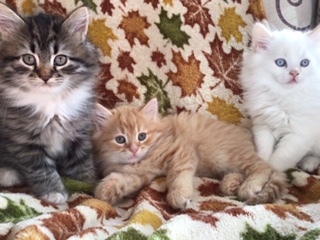 Happy kitties are healthy kitties! I also send a weekly update newsletter to waiting families. It gives them updates every Sunday of mommas that go into heat, breedings, weight gains, and even photos of the babies wiggling in mommas belly! I send videos, pictures, and general happenings from babies births to take home info. People love this and a lot have asked to remain on the newsletter update even after adopting! The process of adopting is as follows. I suggest you visit prior to putting a deposit to see if my cattery is the right fit for your family. If it is, a deposit agreement (posted on my website whispurrscattery.com) and $150 deposit puts you on the wait list. When your number comes up, you’d visit to choose a baby(or should I say, a baby chooses you! Lol) when you find “the one” the first $550 is due. You are never stuck with the last baby of a litter, you can pass and wait for a future litter. The final $550 is due at pickup when you sign the contract(also posted on my website for review). They are vaccinated and dewormed before leaving as well. I never ship the babies, and I do not sell by photos over the internet. My families are very important to me. I keep in touch with every one after adoption. I love getting updates from them as they grow. I have truly made some wonderful friendships along the way. The basic standard of my cattery is to be honest and treat everyone with respect. This is a very important journey that I have been blessed to be a part of, and when people choose my cattery, it is something that makes me very proud! I love what I do, to me it’s the best job in the world being a mom to my own human children, and my furbabies!